The original pilot to Green Light, Red Light, we decided to release this second, because Hausu was such a ridiculous bit of nonsense, but we couldn’t not release it after what we put Eric through. For episode 2, we tackle the 1988 Nicolas Cage movie Vampire’s Kiss. If you ever wondered where the creepy Nic Cage meme came from, you’ve now found it. That’s this movie. It’s actually one of the less weird things Cage does throughout the film. Check it out! Vampire’s Kiss is available from Amazon as part of a double feature pack with another vampire based comedy, Once Bitten. That one may be a future episode, too. The CPC team is back! In this episode, we start Chapter 2 of the current campaign with an outbreak of zombies in the neighborhood of Ravenswood, home to some of Chicago’s oldest cemeteries. I do some unnecessary voices, and then Chuck tells us about the allowable distances relative to Chuck’s position for ocular irrigation. It’s a hoot! Oh, BTW, in case you’re one of those people that reads these intros, go check out our new podcast! Sammy from this very show is hosting a movie podcast called Green Light, Red Light, where we watch bad movies and then deal with the psychic backlash thereof. Check it out here! For episode 2, we tackle the 1988 Nicolas Cage movie Vampire’s Kiss. By this point, Nic Cage had already starred in films like Moonstruck and Raising Arizona, so we knew he was capable of something good, but things take a sharp turn to the absurd in this movie that launched a thousand memes. 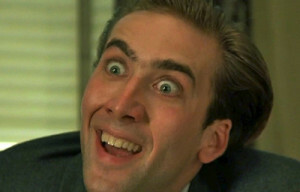 Seriously, that creepy Nic Cage staring meme? That’s this movie. It’s actually one of the less weird things Cage does throughout the film. Check it out! I’m telling you, man, I’m going to win an Oscar in 1995! Welcome to the first full episode of Green Light, Red Light! This week’s movie is House or Hausu, a 1977 Japanese “horror” movie that follows 7 girls as they try to survive the night in a haunted house intent on eating them. That’s the easy description, though the movie defies almost any attempt to classify it. If you want to get a copy of this movie, which we highly recommend, you can purchase it on DVD or Watch Instantly over at Amazon, or you can watch it as part of your Hulu+ membership. The creepy calliope music is called “Fairground Fancy,” courtesy of purple-planet.com. Welcome to the first minisode for Green Light, Red Light! 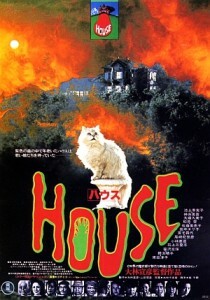 In this episode, we’ll introduce ourselves, tell you a little about how the show is going to work, and preview our first movie, the 1977 Japanese “horror” film House. If you want to watch the film before you listen to the main episode, it’s available on DVD or Instant Watch from Amazon, or you can watch it as part of the Criterion Collection on Hulu+. Introducing Our Newest Podcast: Green Light, Red Light! We’ve been working on this for a while, and now we’re very excited to present our newest podcast, Green Light, Red Light, a podcast where we watch bad movies, hoping they’re so bad, they’re good. 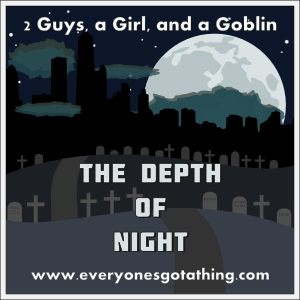 In each episode, Sammy Kampersal from 2 Guys, a Girl, and a Goblin hosts, joined by Jim Kliss, also of 2 Guys, a Girl, and a Goblin, and Nate Sullivan, along with a rotating special guest. At the end of the show, we’ll ask the panel to give one of three verdicts on the films: Green Light – You should definitely see this movie, Yellow Light – If it’s available, you should watch a “best of” compilation, or Red Light – Avoid at all costs. The format of GLRL will be like some other movie related podcasts, where we’ll release minisodes talking about what we’ll be watching next, with full length episodes to follow. Click Here for the Podcast page for more information.